Excerpt from a speech by Councillor Tim Overall, Mayor of Queanbeyan, at the launch of The Manner of their Going by Norman Abjorensen at the Royal Hotel on 18 February 2016. Councillor Overall is the son of Sir John Overall, the first head of the National Capital Development Commission. Along with the vigorous lobbying by many prominent Queanbeyan residents of Australian PMs from the beginning of Federation to see our Capital set within these most suitable environs, our fair city has more than our own share of links with this country's various prime ministers - and more than just the fact that during Canberra's disaster years of Prohibition, many of them would have drunk here in this very hotel in which we now stand! It was our 4th PM, George Reid, who while as Premier of NSW declared that he would 'give up the best piece' of the state for the siting of the Federal Territory - and lo and behold, that just happened to be right beside Queanbeyan! Sir George's brother, the Rev. W.F. Reid, was also the first Presbyterian Minister appointed at Queanbeyan in 1862 while many years later, PM Reid himself received a standing ovation following a political address delivered at the Queanbeyan Protestant Hall. Billy Hughes was welcomed to Queanbeyan by the Mayor, Arthur Collett, in 1920 and again by Mayor James Harris (Canberra's first civil servant) in 1922 in official tours of the Federal Capital site - after the second visit declaring he intended to 'stir things up' given the visible lack of progress! The following year, the Acting PM Dr Earle Page unveiled our impressive WWI memorial which continues to stand proudly at the now Visitor Information Centre. Dr Page would campaign here for the prime ministership proper in the 1931 election, at which time he was beaten by a later visitor, Joe Lyons. In 1926, Stanley Bruce gave a 'forceful and telling address' in the Triumph Theatre in Crawford St in support of the candidature of Mr J.A. Perkins for the seat of Eden-Monaro following the death of our first Member, Sir Austin Chapman. Ten years later, and Joseph Lyons was a regular guest: in 1936 he officially opened the 42nd Annual Show and a few months later delivered the first William Farrer Oration in Queanbeyan, while in 1938, he was the Guest of Honour for Queanbeyan's Centenary Celebrations. For Menzies, it's suggested that his first government was ultimately weakened by the 1940 Air Disaster just outside Queanbeyan, which included the death of 3 Ministers and the Chief of General Staff. By 1946, the Liberal Party opened its election campaign in Queanbeyan with a discourse by Opposition Leader Menzies. Thereafter, Joseph Benedict Chifley was better known as Ben, but less known is that our 16th PM was named for the Sisters at Benedict Convent right here in Queanbeyan, with whom his mother Mary stayed for a time prior to her marriage - and the young Ben was also christened in a gown made by those Queanbeyan nuns - perhaps a sign from above paving the way for his later 'radical reforming' political career that would see his government pass a record 299 Acts of Parliament. 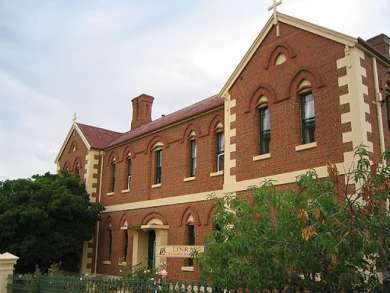 Another linked to the former Benedict Convent was Paul Keating - though despite plentiful suggestions otherwise, he states that he was never an actual owner of Queanbeyan's finest heritage building. This was at the time that musician Geoffrey Tozer had plans to reinvent it as a music conservatorium, a plan which never came to fruition. It was a Queanbeyan boy who would also become Keating's Chief of Staff - Dr Allan Hawke from 1994 to 1996. Similarly scandalous at the time, in 1977, Gough Whitlam had charges brought against him in the Queanbeyan Court of Petty Sessions for conspiracy to deceive the Governor-General Sir John Kerr about the purposes of a US$400m overseas loan. A Sydney lawyer, Mr Danny Sankey brought the charges against Mr Whitlam, Mr Justice Murphy and Dr Jim Cairns, which were eventually dismissed for lack of sufficient evidence to go to trial by the Sitting Magistrate, Mr Leo. And in more modern politics, Queanbeyan, as one of only 4 remaining bellwether seats - those that are said to predict the incoming government of the day - regularly plays host to visiting prime ministerial aspirants, from Hawke to Howard, Rudd to Gillard, Abbott to Turnbull. I'm confident this is a tradition that will continue to earn acclaim - or notoriety - as the pollies seek an 'authentic town experience', or at least, media experience, so close to their ivory towers. Contact us with your story about the prime ministers who have visited your electorate.